For another perspective on the bilateral relationship with the US and Indonesia, CSIS has a new-ish report that includes a chapter on security cooperation. Too busy to read a report? Here’s some CSIS audio-video material that overviews key aspects of the US–Indonesia Comprehensive Partnership. Zachary Keck over at The Diplomat looks at why Indonesia is courting North Korea. Apart from economic imperatives, Zach notes that there’s been long-standing public sentiment that’s favourable to the regime. Lastly, ICYMI, Austalia has a new Indonesian Defence Attaché. 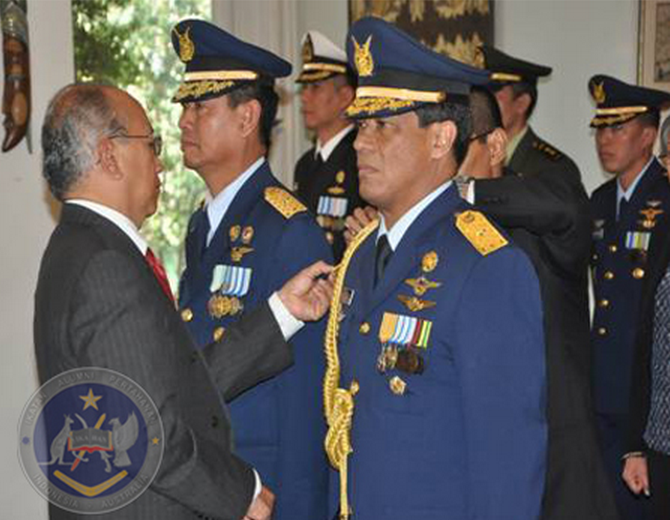 Pictured above are outgoing Attaché Air First Marshal Benedictus Widjanarko (L) and incoming Air First Marshal Wieko Syofyan (R) at the handover ceremony officiated by Indonesian Ambassador HE Nadjib Riphat Keseoma. This entry was posted in Uncategorized by Natalie Sambhi. Bookmark the permalink.